We have created and sewed together a pad which can be positioned under an iPad when it is placed in a person’s lap. The purpose of the iPad radiation shield is to protect the body from the wireless radio frequency (RF) and microwave radiation that’s being emitted from the iPad. Two layers of Cuprotect®, a copper wire mesh, were sewed into the fabric material. First, we tested the shielding pad by creating a constant emitting RF source (DECT phone). The DECT phone operates in the same frequency range as an iPad. We measured the emissions from the phone at a distance of approximately a half of a foot (½ ft.) to obtain a baseline reading. Next, we placed the RF shielding pad between the phone and the measurement probe and recorded the level of emission with the shielding in place. Maximum peak values were recorded. This process was repeated twice with two different instruments. The results are reported in the table below. See images below for the results. Due to the poor lighting conditions, we apologize for the bad image quality. The effectiveness of the Cuprotect® iPad radiation shielding pad is a 95% or 14 dB reduction. Shielding materials will either absorb RF energy and transform it into heat, reflect it away, or both. They will not 100% eliminate the RF fields but significantly reduce them. These materials can be paints, meshes or foils. They are applied at a source, such as a sleeve (Cuprotect®’s Wi-Fi Shield) placed over the Wi-Fi antenna, or a building can be shielded from RF emissions from a near-by cell tower. The shielding materials are applied to the interior or exterior of the building envelop. If shielding is desired, professional testing should be done to ascertain what type of fields are present and at what strength. It is important to choose the right shielding material and to verify that the fields have been reduced afterwards. What are the Steps for a Professional Shielding Application? A professional survey for low-frequency electric and magnetic field and high frequency RF fields should be conducted inside the building. The EMF consultant evaluates the measured level in relationship to preventative precautionary action levels. This involves establishing benchmarks with the client. The Consultant develops a professional shielding concept identifying the areas to be shielded and the materials to be used. A licensed electrician installs a grounding plate and provides proper grounding for the shielding materials. 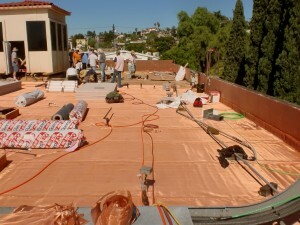 Qualified and trained contractors install the shielding material to walls, roofs or ceilings, and potentially floors. This incorporates other components such as window panes and frames or doors into the shielding system. EMF consultant conducts verification measurements to assure that the benchmark goals have been achieved. Certification that the building is of low EMF and RF levels. What is the Cuprotect® Shielding System? Cuprotect® is a company headquartered in Germany. The shielding material and system is now available through a distributor in the United States. 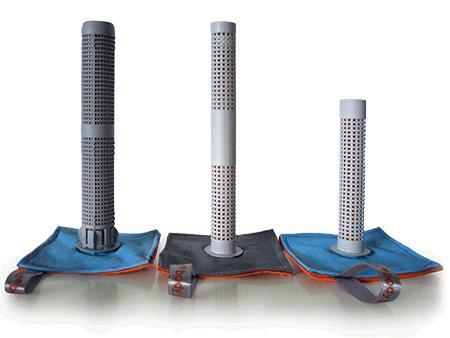 Its founder, Wolfgang Kessel, developed a patented copper wire mesh RF shielding system for buildings. The system has one of the highest shielding effectiveness ratings in the industry. The Cuprotect® material is pliable, light weight, and any commercial, institution, or residential building can be retrofitted to reduce exposure to building occupants. We are technical consultants for the implementation of Cuprotect® shielding systems in the US. Together with Cuprotect® and Premier Roofing, we completed the first commercial radiofrequency (RF) shielding project in the San Diego. A cellular tower is installed on the roof a two-story commercial building and the building owner wanted the exposure to his tenants and their clients to be reduced. The roof was going to be replaced, so the RF shielding system was integrated into the new roofing membrane and the indoor RF levels were significantly reduced. Cuprotect also provides a number of wireless shielding systems for wireless routers and access points. For more information visit their website at www.cuprotect.eu Cuprotect® recently completed the installation of its material at a new 1,600 Megawatt nuclear power plant in Finland. The purpose there was to protect the power plant against electromagnetic pulses from atomic bomb explosion in the thermosphere, electronic air or from ground attacks and solar flares.